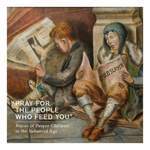 "Pray for the People Who Feed You": Voices of Pauper Children in the Industrial Age was on exhibition at the Schmucker Art Gallery at Gettysburg College, September 9 - October 24, 2015. Duffy, Rebecca S. and Titus, Jill Ogline, ""Pray for the People Who Feed You": Voices of Pauper Children in the Industrial Age" (2015). Schmucker Art Catalogs. 17.